You know the story by now. For many, the iPod touch is the iPhone without the phone and GPS features—no cellular voice calls, no texting, and no EDGE or 3G wireless service. The remaining features that the two have in common (or lack) is often how the iPod touch is judged. In the case of the fourth-generation (4G) iPod touch—available in 8GB ($229), 32 GB ($299), and 64GB ($399) capacities—the two come closer to feature parity than ever before. (Even more so this time around as all three iPod touch models have the same features, unlike with the previous generation of touches.) This, for many people, makes for a compelling iPod. It does for us as well. Thin as the iPhone 4 is, the 4G iPod touch is thinner still—two sandwiched 4G iPod touches come very close to the thickness of the iPhone 4. It’s also a little less wide and lighter than the third-generation iPod touch ( ) that preceded it. Its edges are also more angled. This angling is sharp enough that owners of iPhones and previous iPod touches will have to train themselves to search for the volume and Sleep/Wake buttons near the back edge of the iPod rather than the side and top, respectively. Unlike previous iPod touches, the 4G iPod touch lacks the small black plastic patch on the back’s top-left corner that covered the Wi-Fi antenna. That corner now holds the iPod’s built-in omni-directional microphone and its high-definition rear-facing camera (like the iPhone 4, the 4G iPod touch also has a standard-definition front-facing camera). Thanks to the built-in microphone, you have a way to control the iPod touch hands-free. Press and hold on the Home button until the Voice Control screen appears and tell the iPod what you’d like it to play using the same voice commands you’d use with an iPhone. (Learn more about Voice Control in Talk to your iPod: Inside Apple’s Voice Control.) Voice Control works only for playing music, however. You can’t use it to initiate a FaceTime call (more on FaceTime later in the review). In addition, the 4G iPod touch has a dedicated speaker port, which you find just to the left of the dock connector port at the bottom of the iPod. The second- and third-generation iPod touches also had a speaker, but sound emanated generally from inside the iPod rather than from a dedicated port. Whether it’s the quality of the speaker component inside the iPod or the existence of the port, the 4G iPod touch’s speaker is much brighter than previous touches’. This is welcome as the previous touches’ speakers managed to be tinny and muffled at the same time. The speaker on the current iPod touch doesn’t have the quality of the iPhone 4’s speaker, but it’s a definite improvement over the previous models. The combination of the microphone and speaker means that the iPod touch becomes a better device for Skype/VoIP calls. In the past you could use VoIP apps with the iPod touch (Wi-Fi only, of course), but, because those iPods had no built-in mic, you had to use a headset that included both headphones and a microphone. With the new iPod touch you can make such calls without a headset. Even though the mic is on the back of the iPod, it's sensitive enough to pick up your voice. And the speaker is audible enough to carry on a conversation. The Sleep/Wake button has moved to the top-right edge, and the volume buttons are now two discreet buttons rather than a rocker switch. Although you can control the iPod’s volume, music, and video navigation with headphones that include volume and play controls, you won’t find those headphones in the iPod’s box. Apple provides just the bare-bones earbuds that lack any play controls. We regret this omission as it’s nice to have the option to remotely control an iPod tucked deep in a pocket. If you want that option from Apple, you’ll have to pay $29 for the Apple Earphones with Remote and Mic. Like the iPhone 4, the 4G iPod touch has a 960 by 640 retina display. The display—at least on the iPod touch I tested—has a slightly yellower cast than the previous iPod touch. (That cast is completely unnoticeable unless you put the two devices side by side.) Just as with the iPhone 4, you see no pixels when looking at text on the 4G iPod touch’s screen—images are very, very clean and you can make the display very bright. However, the iPhone 4's display offers better off-angle viewing. When you tilt the iPod touch to approximately a 45 degree angle, it's more difficult to view than an iPhone's display at the same angle. Inside, the 4G iPod touch has Apple’s A4 processor—the same kind of chip found in the iPhone 4 and iPad. I compared the performance of a new 32GB iPod touch with that of a 32GB third-generation model and, quite honestly, I noticed very little performance difference. The 4G iPod touch booted two seconds more quickly (26 seconds versus 28 seconds), but apps launched equally as fast on the two iPods and the two performed nearly identically in a variety of applications. The 4G iPod touch was, however, noticeably more responsive than my first- and second-generation iPod touches. As with previous iPod touches this one has no GPS hardware—it uses Wi-Fi location data only to determine its coordinates. (And yes, by default, that location information is embedded in pictures snapped with the iPod touch’s cameras.) Like the iPhone 4, however, it does have a gyroscope. That gyroscope makes for a richer gaming experience with apps that take advantage of the gyroscope’s ability to sense roll, yaw, and pitch. The iPod touch’s cameras are not identical to those found in the iPhone 4. Although the rear-facing camera shoots video at the same 720p (1280 by 720) resolution, when you compare the results of the same scene shot with each device, differences are apparent. To begin with, the iPod touch’s videos appear to be zoomed out slightly as compared to videos taken with the iPhone 4. Shoot both cameras side by side and the iPod touch captures more of what’s in front of it. Also, the iPod’s rear-facing camera is more likely to produce washed-out results in bright conditions than the iPhone 4’s camera. Still, while its results aren’t as good as those produced by the iPhone 4 or one of the better HD pocket camcorders, the iPod touch takes reasonable-looking videos under well-lit conditions. 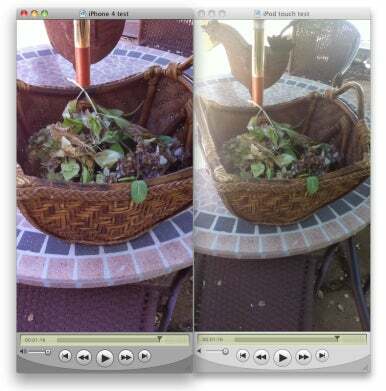 In bright light the video shot with the iPod touch's rear-facing camera (right) is more susceptible to being washed out than the iPhone 4's video (left). In under-lit conditions you more clearly see the difference between the two devices’ cameras. The iPod touch’s video is grainier and shows less detail. And, unlike with the iPhone 4, you don’t have the option to switch on the flash because the iPod lacks a flash. Rather, the iPod touch includes a backside illumination sensor, which is designed to make the rear-facing camera perform better in low-light. Yet even with this sensor the iPod touch’s results were poorer than the iPhone 4. But perhaps without the illumination sensor they’d be worse yet. The 4G iPod touch supports Apple’s $5 iMovie app ( ). Just as with the iPhone 4, you can create movies on the iPod touch complete with titles, themes, and soundtracks. And, you can now upload those movies in HD. Under iOS 4 on the iPhone 4, you could create and export 720p movies, but when you uploaded them from the Photos app their resolution was reduced. With iOS 4.1 that’s no longer the case. You can now upload HD videos to YouTube and a MobileMe gallery and they retain their 720p resolution. I mentioned that with video, the iPod touch’s rear-facing camera is a bit more zoomed out than the iPhone 4’s. The opposite is true with still images. With these images, the iPod’s camera is more zoomed in, hinting at a smaller sensor. Also, iPhone 4’s camera captures stills at 1936 by 2592 pixels, while the iPod touch’s rear-facing camera shoots at 720 by 960 pixels. 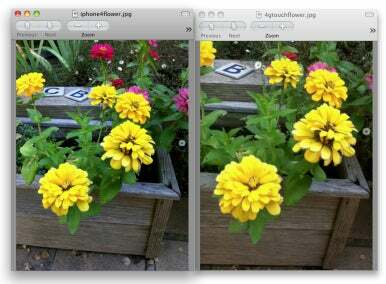 That’s 5 megapixels on the iPhone 4 versus less than 1 megapixel on the iPod touch. Given the lower resolution and lack of a flash, it shouldn’t be surprising that the 4G iPod touch’s still pictures don’t measure up to the iPhone 4’s. The images it produces are far less detailed and the camera’s more susceptible to being blown out when capturing bright images—vibrant yellows, pinks, and reds, for example. Inside, in under-lit conditions, the iPod touch’s camera pushes very hard to get the image, but in the process can produce grainy and washed out results. Unless you’re shooting under ideal conditions or you don’t have a better camera at hand, this is not the camera you want to use to create prints. The iPod touch's lower-resolution rear-facing camera (right) produces less detailed stills than the iPhone 4's camera (left). With the cameras comes FaceTime, and it works very much as it does on the iPhone 4. As with an iPhone 4, you have the option to switch between the front- and rear-facing camera and your voice is picked up by the external mic. Again, even though the microphone is on the back of the iPod—and thus facing away from you as you talk into the front of the device—the mic is sensitive enough to pick up your voice. And, again, the internal speaker is loud enough that you can easily hear the person speaking to you. You can optionally use a compatible wired headset—the microphone and headphones on Apple’s iPhone headset works perfectly with FaceTime. My Plantronics Bluetooth headset, however, didn’t work at all for FaceTime calls. To make a call, just open a contact. (You can choose contacts from Favorites, Recents, and Contacts screens within the FaceTime app or select a contact within the Contacts app). On a contact’s screen will be a FaceTime button. Tap it to initiate a FaceTime call. Alternatively, if you know that the person you’re calling has an iPhone 4, you can simply tap that phone’s number in the Contact screen and the iPod touch will place a FaceTime call. All you need is a Wi-Fi connection. You can disable FaceTime simply by tapping FaceTime in the Settings screen and flicking the On/Off toggle switch to Off. The iPod touch is wildly popular for good reason. It’s an extremely versatile device—media player; pocket gaming machine; productivity tool; Internet communication device; and, with this latest update, pocket camcorder, still camera, handheld recorder, and FaceTime video phone. While its cameras fail to produce results as good as the iPhone 4, they make FaceTime possible, which allows us to more easily forgive their less-than-pristine images and movies. Despite the cameras’ weaknesses, this is a very good iPod touch. If you have a third-generation iPod touch and lack an iPhone 4, this iPod’s FaceTime capabilities may tempt you to upgrade. If you’re unhappy with the performance or capacity of an even earlier iPod touch, this iPod is more compelling still. And if you’re without iPhone or iPod touch and have been holding out for a device thiiiis close to the iPhone—without the incumbent data plan and two-year commitment (and, of course, the phone features)—that realization has never been closer. It’s hard to imagine what more Apple could do to tempt you. Updated 9/7/10 9:00 PM to include information about the iPod touch's off-angle viewing.